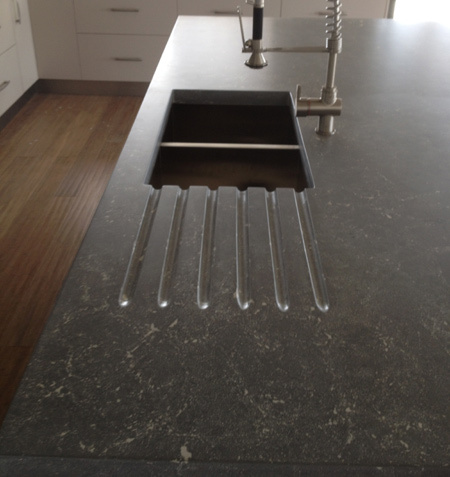 We are pleased to have students all over the world, each creating gorgeous concrete countertops in whatever country they call home. Today I’d like to introduce you to one of our Australian students, Peter Bennett. We had the pleasure of meeting him at our Ultimate Concrete Countertop Training in 2013. I’m sure you’ll agree that his stunning work is helping to advance the concrete countertop (or as they say, benchtop) industry in Australia. Right now Pete is hard at work finishing up a variety of projects. When we last spoke he had just finished up a kitchen project and was getting ready to work on a few bathroom vanities. Some of his work is packed (also known as hand pressed) concrete, which he especially enjoys working with because you can see the beautiful veins throughout the finished piece. Since Pete lives and works in Australia, he faces a few unique challenges that our United States students do not. Getting certain supplies locally can be a challenge and he often has to import things from the U.S. Exposure is another challenge for his growing business. He’s been in business for about 6 years now and only in the past 12 months have things really started to take off. He’s now getting 2-4 new inquiries a week, thanks to reality TV and the growing exposure of concrete countertops. 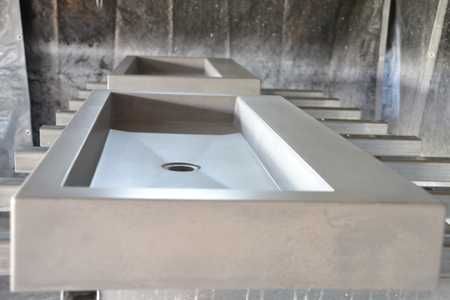 You can see examples of Pete’s growing body of concrete benchtop, sink and furniture work in the Sydney area and beyond on his company website Future Concrete Designs: www.futureconcretedesigns.com.au. While constructing concrete countertops in Australia does have some unique challenges, it doesn’t make Pete love it any less. One of his favorite opportunities is being able to see people’s faces light up when they see what he can do. He loves surprising people with the unlimited possibilities of concrete. If he could give one piece of advice to his fellow concrete artisans it would be to stop making excuses. You make your own destiny. He’s helped train many who start out excited and then quickly leave the business. Keep at it and use the tools you’ve been given to succeed. Thank you Pete for taking the time to share your work and your advice with us!